Make your Storyline 3 courses more relatable with illustrated and photographic characters in a variety of clothing, hairstyles, poses, and expressions. In Slide View, go to the Insert tab on the Storyline ribbon and click Character. To help you find the character you want, use the drop-down list in the upper right corner to change the sort order, and use the slider in the bottom left corner to zoom in and out. Characters behave like other images in Storyline. After adding them to your course, you can move, resize, crop, format, and animate them. 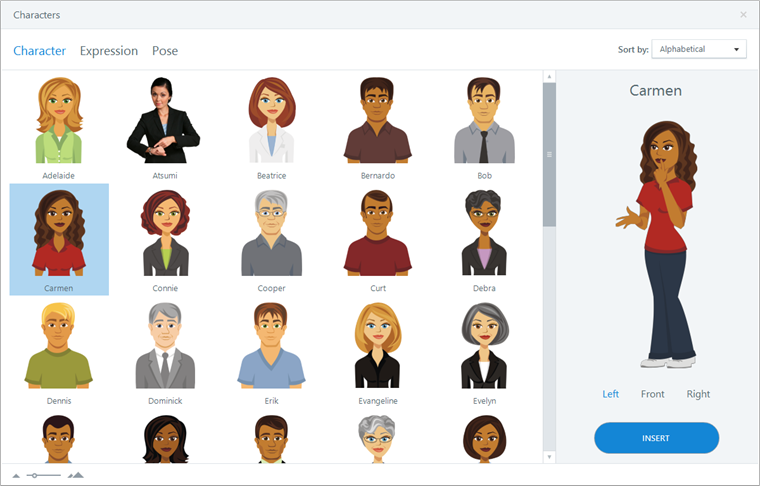 If you want access to our expanding library of more than 100,000 combinations of characters, expressions, and poses, check out Articulate 360. It includes our ever-expanding Content Library and the latest version of Storyline.